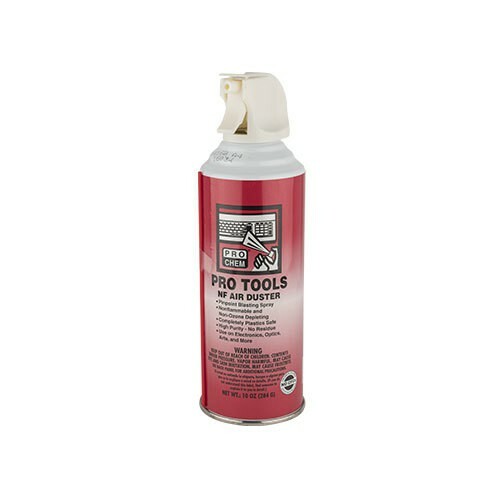 PRO TOOLS NF AIR DUSTER | Pro Chem, Inc. PRO TOOLS NF AIR DUSTER utilizes the highest purity, nonflammable material to create a non-residue formula that is completely plastic safe and contains no ozone depleters. Its blasting precision spray quickly and easily removes dirt and dust from delicate surfaces, including all electronic or electrical devices from computers and office equipment to industrial machinery and manufacturing equipment. Be sure to hold can near upright to prevent accidental freezing. If in a confined space, be sure to angle blast to open area so deposits will be removed and not just moved. WIDE AREA CLEANING: Hold can about 6-8 inches from surface to be cleaned. Aim sprayer at desired area and squeeze trigger using a sweeping side to side motion. PRECISION CLEANING: Remove attached extension tube and insert firmly into the nozzle opening. Hold can about 2-3 inches from surface to be cleaned. Aim sprayer and gently squeeze trigger until clean. Do not use on camera mirrors.